PowerFilm• has perfected the thin-film solar panel for the marine environment; from sailing to trolling, PowerFilm solar will energize your time on the water. Proven weatherproof, PowerFilm marine solar panels have been successfully subjected to full salt water immersion testing and are constructed to stand up to waterlogged areas, whether it's coastal or inland. 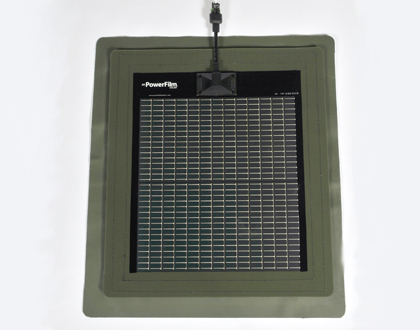 The PowerPier solar panel maintains the charge in your boat lift battery and boat battery. Fully capable of offsetting most parasitic power loads, such as hydraulic motors, bilge pumps, sound systems, electronics and other items that naturally drain your battery, the PowerPier keeps you ready to go boating at a moments notice.